In a career full of achievements Joanne Mucz Vergara saved the best for last. 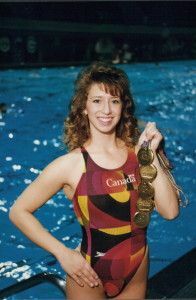 Swimming at the 1992 Paralympic Games in Barcelona, Spain, the Winnipeg native won five gold medals and set five world records. She capped her last major competition by being chosen Canada’s flag-bearer for the closing ceremonies. Mucz Vergara, a bilateral below-the-knee amputee, began swimming at the age of three. Her competitive fires were stoked by athletic brothers who were involved in sports. Being in the water levelled the playing field for her. At nine years old Joanne joined the Manta Swim Club. She first made an international splash by winning three gold, a silver and two bronze medals at the 1986 World Championships for the Disabled in Gothenburg, Sweden. The next year she won six gold and the award for Outstanding Performance at the second International Games for the Disabled in Paris. At the 1988 Paralympics in Seoul, Korea, Mucz Vergara won gold, silver and bronze plus set a world record. That set the stage for Barcelona. “There was a lot of time, a lot of workouts, a lot of effort that went toward those Games,” she said. “I was very driven about it. To be able to peak, to do your best performances in as many races as I did at one competition, I was so over the moon with what I had accomplished. Joanne retired in 1992 but believes swimming helped shape her later life. Mucz Vergara is happy with the increased awareness of Paralympic sports. Mucz Vergara, married Hector Vergara in 2001 and has three children.